My guest blogger for this post is my mom’s Alexander teacher, Michaela Hauser-Wagner! As I was writing about my work with older students, I changed the newsletter title to ‘Upward Mobility’. As much as it made me chuckle, it seems a poignant description of most Alexander work, but even more so when I consider the typical posture and movement issues of an older generation. Myrtie came to me almost four years ago. I was worried she wouldn’t be able to walk up my front steps as she was in serious hip pain and used a cane. Her excellent and fast recovery could easily be attributed to sheer luck, positive attitude, “good” genes, ability to heal tissues, resilience to pain, etc. 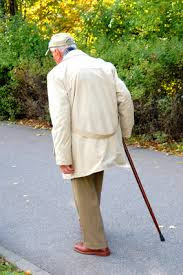 However, after she was out of pain and had donned her cane, we continued to work on issues apparent at any age, but more detrimental in an older population: balance, strength, body awareness, meaningful rest and breathing. 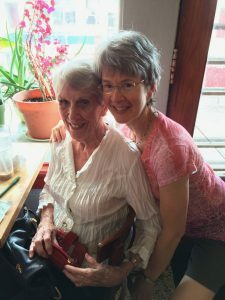 In the course of those past years, I saw Myrtie recover from all kinds of discomforts and handicaps, and I don’t mean ‘deal with them’ – but truly recover from them. She astounds me more than I can say. Myrtie sitting & moving into the chair, maintaining a light easy balance. Myrtie doing wall planks, developing her muscle tone and strength, while lengthening upward along her spine and moving freely through her joints. You’d better believe that this woman can still tear up the dance floor! Do you find it difficult to get in and out of a chair? Is it hard to turn your head from side to side? Has your breathing become more shallow? Has your voice become weaker? Are you feeling nervous and anxious about life? Have you stopped doing the things that you love like walking, golfing, dancing or gardening? Taking Alexander lessons is an intelligent way of addressing all these concerns. With an older population huge gains are possible in the critical areas of balance, uprightness, flexibility, mobility, muscle tone and strength. And perhaps most importantly in the aftermath of falls and health setbacks, confidence. Carolyn is a new student, who comes to me after two knee replacements. Her predominant concern is the fear of falling; she wants to work on her balance and is open to all conditions that contribute to her mobility and safety; she has experimented walking with a cane and a borrowed walker and brings both to her first appointment. To date Carolyn had seven weekly lessons. During her first appointment we decided it is better to purchase an adequate walker, which gives her symmetrical support and promotes stability. The added feeling of safety makes it easier to apply ‘upward mobility’ – to look up and out, to walk with straighter posture and so to reduce the strain on the lower back that is inevitable when we hunch forward for too long. 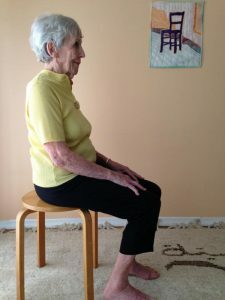 Getting up from a chair is part of all lessons; a thought up along the spine improves posture, sitting on a well balanced pelvis reduces holding patterns in thighs and pelvis muscles, feet releasing to the floor secure support from the ground up, flexibility in the hip joints are initiating a forward movement of the torso, neck freeing, head releasing upward, spine following the head, giving a direction into the space above the head… all these directions together do the job, they help Carolyn to get up with surprising ease. 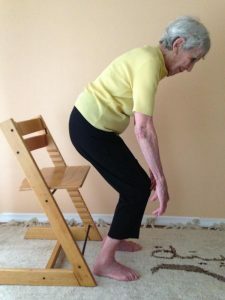 On the way back towards the chair, similar directions are encouraged, the head always leads up and the spine always follows into length; the knees release forward and the hips fold; a rather slow and mindfully guided downward movement requires strength and promotes tone in leg muscles as well as balance and stability. The fear (of not finding the chair) subsides with better spatial awareness and movement skill. 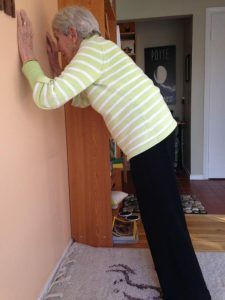 I also borrow existing exercises, for example the wall plank that Myrtie is demonstrating above. 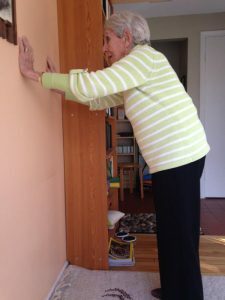 She uses the familiar upward directions of the spine and her arms for weight bearing against the wall, using strength in arms and back, with an eye on bone loss and osteoporosis awareness. When we teach on the table the student finds a safe resting position and physical release into symmetry; she gains a deep level of body awareness, can experience flexibility in joints without the strain or anxiety of upright activities, can experience breathing with more equanimity and practice Alexander directions. For balance my students are often standing on a foam pad, and again, we practice finding the support under the feet and into the ground, the balance of head, neck and back. Anxiety about falling changes with new experiences and better body awareness. We want to challenge the system to do as much as possible with confidence and stability, which is the opposite of fear, contraction or inactivity. There are many different balance exercises that can be adapted to the support level the student needs, most importantly, a wall or chair by her side to practice independently at home. We walk forward and backward and observe gait patterns in the mirror. Optimization of symmetry in movement of knees and consequently hips are important; if gait patterns are distorted, further injury or pain are more likely, balance will be compromised, strength is being developed unevenly. Carolyn decided to practice an exercise I had developed, three times a day 10 times each. I call it Up on Two, Down on One. 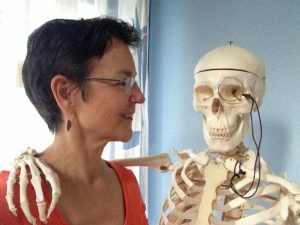 By her next appointment I couldn’t believe the progress she had made in terms of using her hip joints symmetrically; based on understanding and awareness she could change a habit by thinking in activity and build strength on the way. Now we will obviously have to apply this more symmetrical pattern to walking. Stand next to a chair or wall for support, ideally touch only with your finger tips and only when you need the outside support. Go up on your toes, all ten of them with both feet, then send the right knee forward, so that the left heel comes down to the floor. Up again on your toes with both feet, then send the left knee forward, so that the right heel stands on the floor. You will notice how this engages the muscles in your calves and thighs; it promotes balance, keeps your ankles flexible, guides the knees forward, works the fascia on the soles of your feet, and the general upward thought for the body tones all postural muscles. Stay tuned: Mary Derbyshire‘s upcoming book is titled Agility at Any Age. I will happily take credit for persuading my mom to study with Michaela. The results have made our whole family very happy, as Mom tossed away her cane and got back to dancing, Wii-bowling, Bocce ball and various other livelinesses. Thinking about giving the Technique a try? Ask about the special Agile Mind, Lively Body jump-start package.